, with a positive electric charge of +1e elementary charge and a mass slightly less than that of a neutron. Protons and neutrons, each with masses of approximately one atomic mass unit, are collectively referred to as “nucleons“. 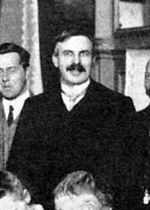 The word proton is Greek for “first”, and this name was given to the hydrogen nucleus by Ernest Rutherford in 1920. In previous years, Rutherford had discovered that the hydrogen nucleus (known to be the lightest nucleus) could be extracted from the nuclei of nitrogen by atomic collisions. Protons were therefore a candidate to be a fundamental particle, and hence a building block of nitrogen and all other heavier atomic nuclei. In the modern Standard Model of particle physics, protons are hadrons, and like neutrons, the other nucleon (particles present in atomic nuclei), are composed of three quarks. 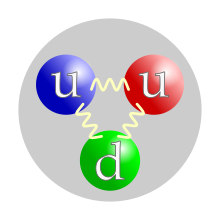 Although protons were originally considered fundamental or elementary particles, they are now known to be composed of three valence quarks: two up quarks of charge +2/3e and one down quark of charge –1/3e. The rest masses of quarks contribute only about 1% of a proton’s mass, however. The remainder of a proton’s mass is due to quantum chromodynamics binding energy, which includes the kinetic energy of the quarks and the energy of the gluon fields that bind the quarks together. Because protons are not fundamental particles, they possess a physical size, though not a definite one; the root mean square charge radius of a proton is about 0.84–0.87 fm or 6984840000000000000♠0.84×10−15 to 6984870000000000000♠0.87×10−15 m.
At sufficiently low temperatures, free protons will bind to electrons. However, the character of such bound protons does not change, and they remain protons. 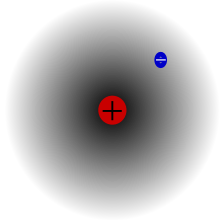 A fast proton moving through matter will slow by interactions with electrons and nuclei, until it is captured by the electron cloud of an atom. The result is a protonated atom, which is a chemical compound of hydrogen. In vacuum, when free electrons are present, a sufficiently slow proton may pick up a single free electron, becoming a neutral hydrogen atom, which is chemically a free radical. Such “free hydrogen atoms” tend to react chemically with many other types of atoms at sufficiently low energies. When free hydrogen atoms react with each other, they form neutral hydrogen molecules (H2), which are the most common molecular component of molecular clouds in interstellar space. Protons and neutrons are both nucleons, which may be bound together by the nuclear force to form atomic nuclei. The nucleus of the most common isotope of the hydrogen atom (with the chemical symbol “H”) is a lone proton. The nuclei of the heavy hydrogen isotopes deuterium and tritium contain one proton bound to one and two neutrons, respectively. All other types of atomic nuclei are composed of two or more protons and various numbers of neutrons. Rutherford knew hydrogen to be the simplest and lightest element and was influenced by Prout’s hypothesis that hydrogen was the building block of all elements. Discovery that the hydrogen nucleus is present in all other nuclei as an elementary particle led Rutherford to give the hydrogen nucleus a special name as a particle, since he suspected that hydrogen, the lightest element, contained only one of these particles. He named this new fundamental building block of the nucleus the proton, after the neuter singular of the Greek word for “first”, πρῶτον. However, Rutherford also had in mind the word protyle as used by Prout. Rutherford spoke at the British Association for the Advancement of Science at its Cardiff meeting beginning 24 August 1920. Rutherford was asked by Oliver Lodge for a new name for the positive hydrogen nucleus to avoid confusion with the neutral hydrogen atom. He initially suggested both proton and prouton (after Prout). Rutherford later reported that the meeting had accepted his suggestion that the hydrogen nucleus be named the “proton”, following Prout’s word “protyle”. The first use of the word “proton” in the scientific literature appeared in 1920. Experiments at the Super-Kamiokande detector in Japan gave lower limits for proton mean lifetime of 7041208280159999999♠6.6×1033 years for decay to an antimuon and a neutral pion, and 7041258772319999999♠8.2×1033 years for decay to a positron and a neutral pion. Another experiment at the Sudbury Neutrino Observatory in Canada searched for gamma rays resulting from residual nuclei resulting from the decay of a proton from oxygen-16. This experiment was designed to detect decay to any product, and established a lower limit to a proton lifetime of 7036662709600000000♠2.1×1029 years. The internal dynamics of protons are complicated, because they are determined by the quarks’ exchanging gluons, and interacting with various vacuum condensates. Lattice QCD provides a way of calculating the mass of a proton directly from the theory to any accuracy, in principle. The most recent calculations claim that the mass is determined to better than 4% accuracy, even to 1% accuracy (see Figure S5 in Dürr et al.). These claims are still controversial, because the calculations cannot yet be done with quarks as light as they are in the real world. This means that the predictions are found by a process of extrapolation, which can introduce systematic errors. It is hard to tell whether these errors are controlled properly, because the quantities that are compared to experiment are the masses of the hadrons, which are known in advance. More conceptual approaches to the structure of protons are: the topological soliton approach originally due to Tony Skyrme and the more accurate AdS/QCD approach that extends it to include a string theory of gluons, various QCD-inspired models like the bag model and the constituent quark model, which were popular in the 1980s, and the SVZ sum rules, which allow for rough approximate mass calculations. These methods do not have the same accuracy as the more brute-force lattice QCD methods, at least not yet. The problem of defining a radius for an atomic nucleus (proton) is similar to the problem of atomic radius, in that neither atoms nor their nuclei have definite boundaries. However, the nucleus can be modeled as a sphere of positive charge for the interpretation of electron scattering experiments: because there is no definite boundary to the nucleus, the electrons “see” a range of cross-sections, for which a mean can be taken. The qualification of “rms” (for “root mean square“) arises because it is the nuclear cross-section, proportional to the square of the radius, which is determining for electron scattering. The internationally accepted value of a proton’s charge radius is 6984876800000000000♠0.8768 fm (see orders of magnitude for comparison to other sizes). This value is based on measurements involving a proton and an electron (namely, electron scattering measurements and complex calculation involving scattering cross section based on Rosenbluth equation for momentum-transfer cross section), and studies of the atomic energy levels of hydrogen and deuterium. However, in 2010 an international research team published a proton charge radius measurement via the Lamb shift in muonic hydrogen (an exotic atom made of a proton and a negatively charged muon). As a muon is 200 times heavier than an electron, its de Broglie wavelength is correspondingly shorter. This smaller atomic orbital is much more sensitive to the proton’s charge radius, so allows more precise measurement. Their measurement of the root-mean-square charge radius of a proton is “6984841840000000000♠0.84184(67) fm, which differs by 5.0 standard deviations from the CODATA value of 6984876800000000000♠0.8768(69) fm“. In January 2013, an updated value for the charge radius of a proton—6984840870000000000♠0.84087(39) fm—was published. The precision was improved by 1.7 times, increasing the significance of the discrepancy to 7σ. The 2014 CODATA adjustment slightly reduced the recommended value for the proton radius (computed using electron measurements only) to 6984875100000000000♠0.8751(61) fm, but this leaves the discrepancy at 5.6σ. The international research team that obtained this result at the Paul Scherrer Institut in Villigen includes scientists from the Max Planck Institute of Quantum Optics, Ludwig-Maximilians-Universität, the Institut für Strahlwerkzeuge of Universität Stuttgart, and the University of Coimbra, Portugal. The team is now attempting to explain the discrepancy, and re-examining the results of both previous high-precision measurements and complex calculations involving scattering cross section. If no errors are found in the measurements or calculations, it could be necessary to re-examine the world’s most precise and best-tested fundamental theory: quantum electrodynamics. The proton radius remains a puzzle as of 2017. Perhaps the discrepancy is due to new physics, or the explanation may be an ordinary physics effect that has been missed. However, in such an association with an electron, the character of the bound proton is not changed, and it remains a proton. The attraction of low-energy free protons to any electrons present in normal matter (such as the electrons in normal atoms) causes free protons to stop and to form a new chemical bond with an atom. Such a bond happens at any sufficiently “cold” temperature (i.e., comparable to temperatures at the surface of the Sun) and with any type of atom. Thus, in interaction with any type of normal (non-plasma) matter, low-velocity free protons are attracted to electrons in any atom or molecule with which they come in contact, causing the proton and molecule to combine. Such molecules are then said to be “protonated“, and chemically they often, as a result, become so-called Brønsted acids. ). The proton is a “bare charge” with only about 1/64,000 of the radius of a hydrogen atom, and so is extremely reactive chemically. The free proton, thus, has an extremely short lifetime in chemical systems such as liquids and it reacts immediately with the electron cloud of any available molecule. In aqueous solution, it forms the hydronium ion, H3O+, which in turn is further solvated by water molecules in clusters such as [H5O2]+ and [H9O4]+. Also in chemistry, the term “proton NMR” refers to the observation of hydrogen-1 nuclei in (mostly organic) molecules by nuclear magnetic resonance. This method uses the spin of the proton, which has the value one-half. The name refers to examination of protons as they occur in protium (hydrogen-1 atoms) in compounds, and does not imply that free protons exist in the compound being studied. Because the Solar Wind Spectrometer made continuous measurements, it was possible to measure how the Earth’s magnetic field affects arriving solar wind particles. For about two-thirds of each orbit, the Moon is outside of the Earth’s magnetic field. At these times, a typical proton density was 10 to 20 per cubic centimeter, with most protons having velocities between 400 and 650 kilometers per second. For about five days of each month, the Moon is inside the Earth’s geomagnetic tail, and typically no solar wind particles were detectable. For the remainder of each lunar orbit, the Moon is in a transitional region known as the magnetosheath, where the Earth’s magnetic field affects the solar wind but does not completely exclude it. In this region, the particle flux is reduced, with typical proton velocities of 250 to 450 kilometers per second. During the lunar night, the spectrometer was shielded from the solar wind by the Moon and no solar wind particles were measured. Research has been performed on the dose-rate effects of protons, as typically found in space travel, on human health. To be more specific, there are hopes to identify what specific chromosomes are damaged, and to define the damage, during cancer development from proton exposure. Another study looks into determining “the effects of exposure to proton irradiation on neurochemical and behavioral endpoints, including dopaminergic functioning, amphetamine-induced conditioned taste aversion learning, and spatial learning and memory as measured by the Morris water maze. Electrical charging of a spacecraft due to interplanetary proton bombardment has also been proposed for study. There are many more studies that pertain to space travel, including galactic cosmic rays and their possible health effects, and solar proton event exposure. ^ a b c d e f g Mohr, P.J. ; Taylor, B.N. and Newell, D.B. (2015), “The 2014 CODATA Recommended Values of the Fundamental Physical Constants”, National Institute of Standards and Technology, Gaithersburg, MD, US. ^ “proton | Definition, Mass, Charge, & Facts”. Encyclopedia Britannica. Retrieved 2018-10-20. ^ Cho, Adrian (2 April 2010). “Mass of the Common Quark Finally Nailed Down”. Science Magazine. American Association for the Advancement of Science. Retrieved 27 September 2014. ^ “Proton size puzzle reinforced!”. Paul Shearer Institute. 25 January 2013. ^ Antognini; et al. (Jan 2013). “Proton Structure from the Measurement of 2S-2P Transition Frequencies of Muonic Hydrogen” (PDF). Science. 339 (6118): 417–420. Bibcode:2013Sci…339..417A. doi:10.1126/science.1230016. hdl:10316/79993. PMID 23349284. ^ Adair, R.K. (1989). The Great Design: Particles, Fields, and Creation. Oxford University Press. p. 214. Bibcode:1988gdpf.book…..A. ^ Romer A (1997). “Proton or prouton? Rutherford and the depths of the atom”. Am. J. Phys. 65 (8): 707. Bibcode:1997AmJPh..65..707R. doi:10.1119/1.18640. ^ Rutherford reported acceptance by the British Association in a footnote to Masson, O. (1921). “XXIV. The constitution of atoms”. Philosophical Magazine. Series 6. 41 (242): 281–285. doi:10.1080/14786442108636219. ^ Pais, A. (1986) Inward Bound, Oxford Press, ISBN 0198519974, p. 296. Pais believed the first science literature use of the word proton occurs in “Physics at the British Association”. Nature. 106 (2663): 357–358. 1920. Bibcode:1920Natur.106..357.. doi:10.1038/106357a0. ^ Köhn, C.; Ebert, U. (2015). “Calculation of beams of positrons, neutrons and protons associated with terrestrial gamma-ray flashes”. J. Geophys. Res. Atmospheres. 23 (4): 1620–1635. Bibcode:2015JGRD..120.1620K. doi:10.1002/2014JD022229. ^ Köhn, C.; Diniz, G.; Harakeh, Muhsin (2017). “Production mechanisms of leptons, photons, and hadrons and their possible feedback close to lightning leaders”. J. Geophys. Res. Atmospheres. 122 (2): 1365–1383. Bibcode:2017JGRD..122.1365K. doi:10.1002/2016JD025445. PMC 5349290. PMID 28357174. ^ Popkin, Gabriel (20 July 2017). “Surprise! The proton is lighter than we thought”. Science. ^ Heiße, F.; Köhler-Langes, F.; Rau, S.; Hou, J.; Junck, S.; Kracke, A.; Mooser, A.; Quint, W.; Ulmer, S.; Werth, G.; Blaum, K.; Sturm, S. (18 July 2017). “High-Precision Measurement of the Proton’s Atomic Mass”. Physical Review Letters. 119 (3): 033001. arXiv:1706.06780. Bibcode:2017PhRvL.119c3001H. doi:10.1103/PhysRevLett.119.033001. PMID 28777624. ^ Buccella, F.; Miele, G.; Rosa, L.; Santorelli, P.; Tuzi, T. (1989). “An upper limit for the proton lifetime in SO(10)”. Physics Letters B. 233 (1–2): 178–182. Bibcode:1989PhLB..233..178B. doi:10.1016/0370-2693(89)90637-0. ^ Lee, D.G. ; Mohapatra, R.; Parida, M.; Rani, M. (1995). “Predictions for the proton lifetime in minimal nonsupersymmetric SO(10) models: An update”. Physical Review D. 51 (1): 229–235. arXiv:hep-ph/9404238. Bibcode:1995PhRvD..51..229L. doi:10.1103/PhysRevD.51.229. ^ “Proton lifetime is longer than 1034 years”. Kamioka Observatory. November 2009. ^ Nishino, H.; Clark, S.; Abe, K.; Hayato, Y.; Iida, T.; Ikeda, M.; Kameda, J.; Kobayashi, K.; Koshio, Y.; Miura, M.; Moriyama, S.; Nakahata, M.; Nakayama, S.; Obayashi, Y.; Ogawa, H.; Sekiya, H.; Shiozawa, M.; Suzuki, Y.; Takeda, A.; Takenaga, Y.; Takeuchi, Y.; Ueno, K.; Ueshima, K.; Watanabe, H.; Yamada, S.; Hazama, S.; Higuchi, I.; Ishihara, C.; Kajita, T.; et al. (2009). “Search for Proton Decay via p→e+π0 and p→μ+π0 in a Large Water Cherenkov Detector”. Physical Review Letters. 102 (14): 141801. arXiv:0903.0676. Bibcode:2009PhRvL.102n1801N. doi:10.1103/PhysRevLett.102.141801. PMID 19392425. ^ Ahmed, S.; Anthony, A.; Beier, E.; Bellerive, A.; Biller, S.; Boger, J.; Boulay, M.; Bowler, M.; Bowles, T.; Brice, S.; Bullard, T.; Chan, Y.; Chen, M.; Chen, X.; Cleveland, B.; Cox, G.; Dai, X.; Dalnoki-Veress, F.; Doe, P.; Dosanjh, R.; Doucas, G.; Dragowsky, M.; Duba, C.; Duncan, F.; Dunford, M.; Dunmore, J.; Earle, E.; Elliott, S.; Evans, H.; et al. (2004). “Constraints on Nucleon Decay via Invisible Modes from the Sudbury Neutrino Observatory”. Physical Review Letters. 92 (10): 102004. arXiv:hep-ex/0310030. Bibcode:2004PhRvL..92j2004A. doi:10.1103/PhysRevLett.92.102004. PMID 15089201. ^ Timothy Paul Smith (2003). Hidden Worlds: Hunting for Quarks in Ordinary Matter. Princeton University Press. Bibcode:2003hwhq.book…..S. ISBN 978-0-691-05773-6. ^ Ball, Philip (Nov 20, 2008). “Nuclear masses calculated from scratch”. Nature. Retrieved Aug 27, 2014. ^ Reynolds, Mark (Apr 2009). “Calculating the Mass of a Proton”. CNRS International Magazine (13). ISSN 2270-5317. Retrieved Aug 27, 2014. ^ a b Durr, S.; Fodor, Z.; Frison, J.; Hoelbling, C.; Hoffmann, R.; Katz, S.D. ; Krieg, S.; Kurth, T.; Lellouch, L.; Lippert, T.; Szabo, K.K. ; Vulvert, G. (2008). “Ab Initio Determination of Light Hadron Masses”. Science. 322 (5905): 1224–1227. arXiv:0906.3599. Bibcode:2008Sci…322.1224D. CiteSeerX 10.1.1.249.2858. doi:10.1126/science.1163233. PMID 19023076. ^ Perdrisat, C.F. ; Punjabi, V.; Vanderhaeghen, M. (2007). “Nucleon electromagnetic form factors”. Progress in Particle and Nuclear Physics. 59 (2): 694–764. arXiv:hep-ph/0612014. Bibcode:2007PrPNP..59..694P. doi:10.1016/j.ppnp.2007.05.001. ^ Boffi, Sigfrido; Pasquini, Barbara (2007). “Generalized parton distributions and the structure of the nucleon”. Rivista del Nuovo Cimento. 30 (9): 387. arXiv:0711.2625. Bibcode:2007NCimR..30..387B. doi:10.1393/ncr/i2007-10025-7. ^ Joshua, Erlich (December 2008). “Recent Results in AdS/QCD”. Proceedings, 8th Conference on Quark Confinement and the Hadron Spectrum, September 1–6, 2008, Mainz, Germany. arXiv:0812.4976. Bibcode:2008arXiv0812.4976E. ^ Pietro, Colangelo; Alex, Khodjamirian (October 2000). “QCD Sum Rules, a Modern Perspective”. In Shifman, M. (ed.). At the Frontier of Particle Physics / Handbook of QCD. At the Frontier of Particle Physics: Handbook of Qcd (In 3 Vols). Edited by Shifman M. Published by World Scientific Publishing Co. Pte. Ltd. pp. 1495–1576. arXiv:hep-ph/0010175. Bibcode:2001afpp.book.1495C. CiteSeerX 10.1.1.346.9301. doi:10.1142/9789812810458_0033. ISBN 978-981-02-4445-3. ^ Pohl, Randolf; Antognini, Aldo; Nez, François; et al. (8 July 2010). “The size of the proton”. Nature. 466 (7303): 213–216. Bibcode:2010Natur.466..213P. doi:10.1038/nature09250. PMID 20613837. ^ Antognini, Aldo; Nez, François; Schuhmann, Karsten; et al. (25 January 2013). “Proton Structure from the Measurement of 2S-2P Transition Frequencies of Muonic Hydrogen”. Science. 339 (6118): 417–420. Bibcode:2013Sci…339..417A. doi:10.1126/science.1230016. hdl:10316/79993. PMID 23349284. ^ “The Proton Just Got Smaller”. Photonics.Com. 12 July 2010. Retrieved 2010-07-19. ^ Conover, Emily (2017-04-18). “There’s still a lot we don’t know about the proton”. Science News. Retrieved 2017-04-29. ^ a b Carlson, Carl E. (May 2015). “The proton radius puzzle”. Progress in Particle and Nuclear Physics. 82: 59–77. arXiv:1502.05314. Bibcode:2015PrPNP..82…59C. doi:10.1016/j.ppnp.2015.01.002. ^ V.D. Burkert; L. Elouadrhiri; F.X. Girod (16 May 2018). “The pressure distribution inside the proton”. Nature. 557 (7705): 396–399. Bibcode:2018Natur.557..396B. doi:10.1038/s41586-018-0060-z. PMID 29769668. ^ Headrick, J.M. ; Diken, E.G. ; Walters, R.S. ; Hammer, N.I. ; Christie, R.A.; Cui, J.; Myshakin, E.M.; Duncan, M.A. ; Johnson, M.A. ; Jordan, K.D. (2005). “Spectral Signatures of Hydrated Proton Vibrations in Water Clusters”. Science. 308 (5729): 1765–1769. Bibcode:2005Sci…308.1765H. doi:10.1126/science.1113094. PMID 15961665. ^ a b “Apollo 11 Mission”. Lunar and Planetary Institute. 2009. Retrieved 2009-06-12. “Space Travel and Cancer Linked? Stony Brook Researcher Secures NASA Grant to Study Effects of Space Radiation”. Brookhaven National Laboratory. 12 December 2007. Retrieved 2009-06-12. ^ a b Shukitt-Hale, B.; Szprengiel, A.; Pluhar, J.; Rabin, B.M. ; Joseph, J.A. “The effects of proton exposure on neurochemistry and behavior”. Elsevier/COSPAR. Retrieved 2009-06-12. Green, N.W. ; Frederickson, A.R. (2006). “A Study of Spacecraft Charging due to Exposure to Interplanetary Protons” (PDF). Space Technology and Applications International Forum – Staif 2006. 813: 694–700. Bibcode:2006AIPC..813..694G. CiteSeerX 10.1.1.541.4495. doi:10.1063/1.2169250. Archived from the original (PDF) on 2010-05-27. Retrieved 2009-06-12. ^ Gabrielse, G. (2006). “Antiproton mass measurements”. International Journal of Mass Spectrometry. 251 (2–3): 273–280. Bibcode:2006IJMSp.251..273G. doi:10.1016/j.ijms.2006.02.013. Eaves, Laurence; Copeland, Ed; Padilla, Antonio (Tony) (2010). “The shrinking proton”. Sixty Symbols. Brady Haran for the University of Nottingham.